This Walking Crutch provides added safety and durability. The user height is 62" to 70". 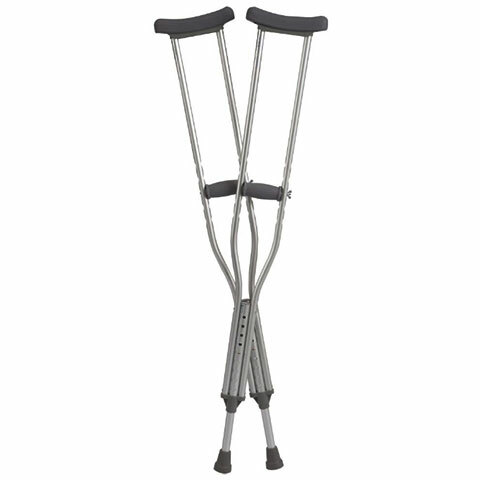 Each crutch is manufactured with steel to ensure additional strength on weight-bearing areas. Extra thick underarm pads and hand grips provide maximum comfort when in use. Replacing the traditional foam rubber with thermoplastic rubber (TPR)—a synthetic blend that lasts longer, resists peeling and most important, is softer. Tool-free push-button adjustment allows the height of the underarm pad to be easily adjusted in 1" increments. Hand grips adjust separately without tools to ensure a proper fit.